Up here in the cold northwest , during the winter months, kayakers will hone their skills at the indoor pool. Every Sunday evening Parks and Rec opens the pool to roll practice, and for a few bucks, you can bring your kayak in and work on your eskimo roll. They limit the number of boats allowed at 12 boats max. Well, that many boats pretty much fills the indoor pool!!! 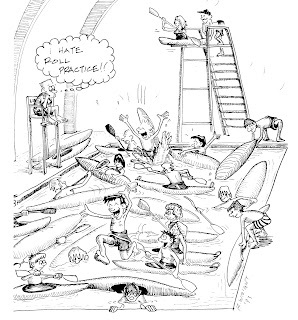 So, it is always fun to witness the chaos during roll practice. Yes, some people have been known to launch their kayaks off the high-dive.